The first time I heard the words “I love you” from AS I really couldn’t believe it. I didn’t know what to say so I was quiet for a while. As we were on the phone, AS was worried that he might have misjudged the situation and thought I was offended. As I uttered those words, tears wear running from my eyes. I was sure they were tears of happiness but I couldn’t hold them back. Something I never thought could ever happen to me had just happened, AS just expressed his love for me. I’m sure there are plenty of you that have experienced that wonderful moment of utter joy in the knowledge that the person you will spend the rest of your life with has just committed himself to you. Sitting on the bed in the hotel in Sikkim, I could have never thought I would ever hear those words ever but there I was holding the phone, crying like a baby. I could hear the relief in AS’s voice once he heard those words. I knew he was crying as well even though I couldn’t see his face. For a long time, both of us were silent and I could feel that AS was really happy as well. When he spoke again he told me that this will be the best day of his life forever. I was so glad that we had reached that point and after some serious conversation started asking silly questions. Me: So tell me honestly from when did you love me? AS: From the first day I saw you at school. Me: No way. Come on tell me the truth. Me: Then why didn’t you tell me before. AS: I always thought I am not your type so held back. Me: Actually a few of my friends told me that you like me but I always told them not to be silly. But I am just very happy that you told me finally. AS: Me too. I was so scared for a while when you didn’t say anything. Me: Ohoo sorry. I was just too surprised. Why were you worried anyway? AS: I thought you don’t love me and saying those words I was going to lose our friendship as well. Me: Ohoo I am so sorry. I was lost for words. I really couldn’t believe what I was hearing. I didn’t expect you would ever say it. AS: I was planning to tell you when we met in Kathmandu in a few weeks. But I was woried you would be engaged to some random guy by then and I would be too late. I didn’t plan for it but it felt right to say it today. I am just glad with the result. M, you are my only love. I have never loved anyone like I love you and even all those year when we hardly talked, I always remembered you and loved you with all my heart. Hearing those words from his mouth was the best of all. He felt at that moment like he couldn’t go another second without telling me how much he loved me. It was very authentic, and true to our relationship. We talked for another couple of hours and both of us were so happy and it seemed crazy to hang up. I had so many questions for him and I am sure he did too. But it was really late for me and he insisted that I go to bed. We were still talking and I don’t remember when I fell asleep but the last thing I remember was his voice before I fell asleep. The message doubled my happiness and I was just over the moon that whole day. As I was getting ready for breakfast, my phone rang. Without checking, I knew it was AS so I answered. AS: hello my love. How are you, did you sleep well? AS: So what are you doing today? Me: Dad told me that we got the permit to go to Changu Lake so heading there soon. AS: That is good news. Have fun and take care. Me: I will. BTW there may not be network reception there so we won’t be able to talk. AS: I am going to bed soon so I will call you when I wake up. By then you should be back. Me: That sounds good. Sleep well. AS: Ok take care. I love you M. I wish you were here with me so I can give you big hug. Me: I know. I wish we can meet soon too. I love you too A. Hope your ticket will work out so I can see you when I get back to Nepal. AS: Ok go now and I will call you later. Love you dear. I went to eat breakfast and went to explore the beautiful lake. For me everything was looking more beautiful, greener and more amazing. I was so happy about our conversation from last night and the next morning, I was literally day dreaming. Then I got another sms from AS. It made my day even better and then he sent two more before I got the last one that said have a good day and he is off to bed now. I send him a few messages with some nice words. At that stage, I was in an internal euphoria and I was not able to write many lovey dovey things. There were millions of things I wanted to write in those messages but always decided against them. 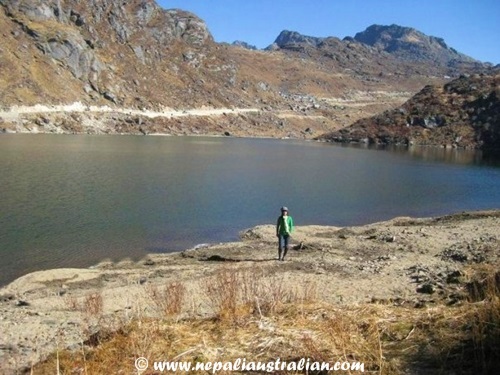 By the time we got to Changu Lake, I could see there was no reception at all on my mobile. The journey there was very interesting. 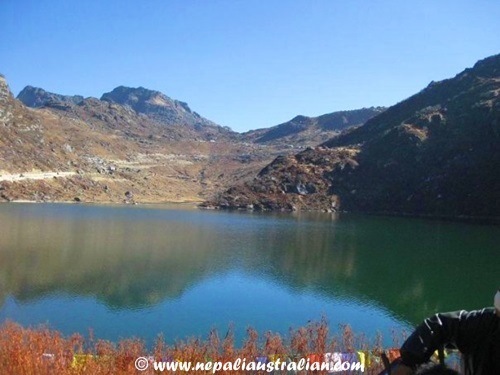 The ethereally beautiful kilometre long 15 m deep Tsomgo / Changu lake is nestled at an incredible altitude of 12,400 ft. TSO means lake and MGO means head in Bhutia language. The vast expanse of crystal clear water is situated on the Gangtok-Nathula highway and is revered by the Sikkimese as sacred. The Nathula pass was part of the famous Silk route connecting the plains of Bengal with Tibet and from thereon China. The lake is also of special significance for the Jhakris [faith healers] of Sikkim who congregate here annually on Guru Purnima from all over the state to offer prayers. 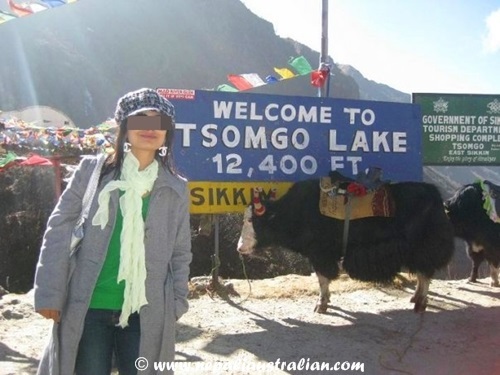 Around the picturesque Tsomgo Lake is woven a rich legend; Sikkimese folk-lore narrates that Tsomgo was initially at Laten, several km away from the present Tsomgo (lake). One night an old woman of Tsomgo dreamt that the lake at Laten would shift to Tsomgo. She was warned to leave the place as soon as possible. The old lady hastened to inform her other yak herder friends but they paid no heed. She hurriedly milked her dri (female yak) and poured the milk on the ground for good luck and left the place with her yaks for Lhachungkar near Thegu. Just before leaving, she saw an inordinately fair lady with gleaming grey hairs, entering Tsomgo. Immediately the earth turned into water and formed Tsomgo lake. 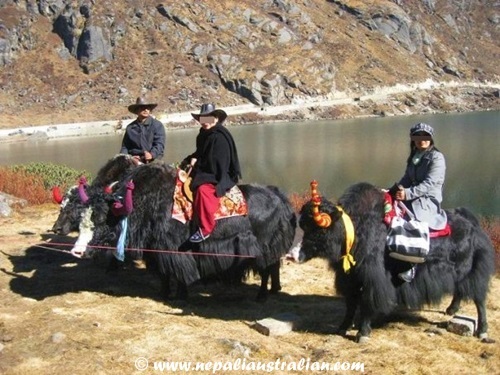 The two obstinate yak herders are believed to have been submerged in the lake along with their yaks. In the times gone by, lamas (Buddhist monks) are said to have foretold the future by observing the color of the lake’s water. If the water had a dark tinge, it foreshadowed a year of trouble and unrest in the state. 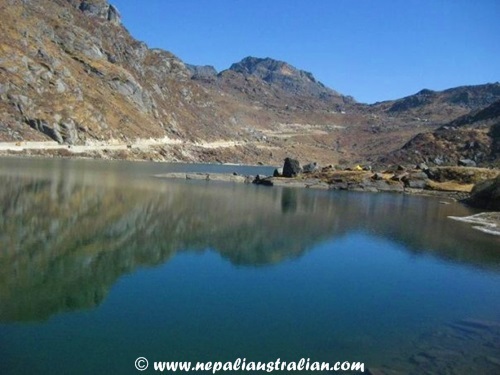 Nathula area has three lakes – Memonchu, Kupup and Tsomgo – and out of three, reports have shown that the Tsomgo Lake is heavily polluted. Tsomgo wetland is amongst the most productive & biologically rich ecosystems and also amongst the most endangered. This wetland is a lake complex joined by some other water bodies Manju I and Manju II. 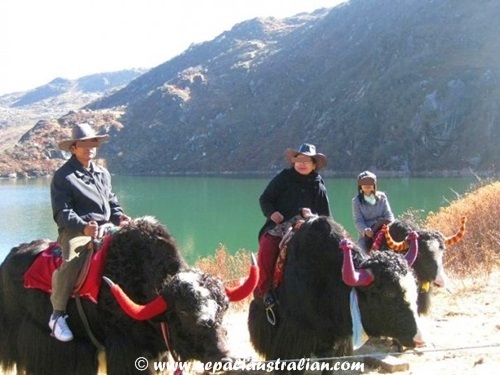 While we were there, we got an opportunity to ride a yak and go around the lake. It was one of the most amazing things I have done and my parents were happy about the ride as well. The ride was slow but very interesting as the Yak owner was trying to direct the obstinate yaks in the right direction every few minutes. Some paths were so narrow that I was scared that both the yak and I would fall off. The lake was so bluish green and beautiful. The air was crisp and pleasantly cold and we saw lots of snow melting around us. I have to say it was one of the most beautiful places I have seen. After we were done we went to the main area. There were several shops selling snacks, souvenirs, warm clothes and snow boots along the periphery of the lake. We had our lunch (momo) there, bought some souvenirs and got back in our jeep to get back to hotel. On the way back, when we reached the area where there was mobile reception, I got 3 messages in my mobile one after another. All of them were from AS and all of them were equally heart melting. I guess I had not had those feeling for so long then that I felt like crying reading those words. But I had to stay composed in front of my parents. As soon as we reached the hotel, I messaged him back and when we all had dinner and everyone went to bed, he called me. Again we talked for hours. He gave me the good news that he would be coming to Kathmandu on the 1st of January. It was a relief because I was booked to go back to Sydney on 15th of January which meant we could spend 2 weeks together. I was not even sure what the future held for us at that stage but I was ready to give it a go. I hadn’t felt so good about anything for so long that I was scared to think it might just be a dream. But every time I spoke to AS, he made me feel so good each and every moment that I began to relax and was slowly accepted that good things were really happening to me. All of the things that were happening were real and AS loved me. Every time he utter those four words,” I love you M”, I was over the moon. I have to be honest; until this day when he utters those words to me, I can feel the same feeling I had the first time. I know it sounds crazy but I love him more every day and my life would be empty without him. We talked about so many things that evening and I fell asleep while on the phone. I will continue more soon. Until then, take care. This entry was posted in India, Our Story, Relationship, Travel and tagged Changu Lake, dating, i love you, relationships, sikkin. Bookmark the permalink. I was amazed to see the three of you on yakback. It was one of the fun holiday activates for us for sure. Amazing creatures. Wonderful story, M. Just wonderful. I wish I could relate to you my similar story, but can’t just yet. It is hard to keep the emotions in check, isn’t it? You visited some beautiful places, and I’m glad you’re willing to share them here. Sid, I am sure slowly but surly you get there. Just keep the fate and be strong. I wish you all the luck. By the way India looks beautiful I have never been to north east part of it. Looks like I have a lot to see in my own home country ..
Hi m; I thouroughly could feel why u did cry for. Isnt this anazing? God bless u with togetherness and immense love. Thank you gal. I have been missing you for a while now. 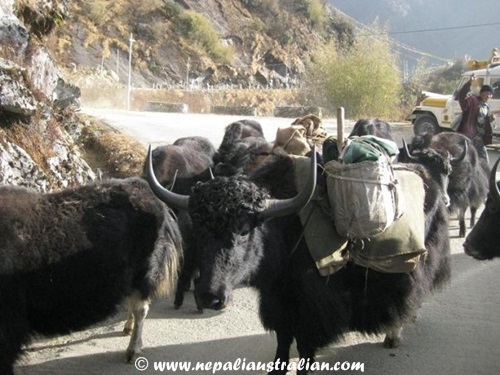 Great story and love the sub story, riding a yak… how cool is that? what a story girl 🙂 I have goosebumps reading your posts.cant wait to hear more. I am so gladdddd you have met each other. I definitely cried reading this. Its beautiful. The first time A told me “I love you” .. I cried too, unfortunately he was in front of me and I felt like a fool, like I couldn’t justify the crying. That was the first to the so much more crying he’d have to tolerate (little did he know) ..
All I can say is.. aww bless!! Awww thats wonderful. Most men are just like.. rocks. Lol, only emotional in strife. But even though I wished they understood tears more.. I would get freaked out by a emotional guy avec tears, like I want to be able to cry and be mushy-handled without having to do the same in return..
Haha same case here. And when they do cry you know its something really really deep. For us, you can’t even detect. A lost puppy would make me whimper. Gosh. I’ve controlled myself and I’m a lot better now, yet it gives in sometimes! I am more silly during the cycle. I agree, like yesterday I wanted to cry … my sister was in shower when I got home from work and I wanted to cry about how no one cared about the fact that I just got home! LOL.. terrible!